Andrea de Michaelis is a writer, speaker, visionary and publisher of Horizons Magazine, Florida’s mind/body/spirit magazine. I became a student of meditation and yoga philosophy shortly after graduating from high school in Hialeah, Florida, where I grew up just blocks from the world famous Flamingo Race Track. During the 1970’s, I explored various philosophies, eastern and western, and began what would be a 22 year career as a paralegal. While a corporate setting in the 70’s may have seemed unlikely to foster deeper contemplation of life, much less spiritual growth, it drew me into the deep, private pains of divorce clients and criminal defendants, all of whom were, in one way or another, passionately asking, “why me?” Why, indeed? Between 1968-1976, my two half brothers died in Vietnam, my grandparents died of old age, my first husband died in an accident, my second husband died of liver cancer, and my youngest brother committed suicide. Thus began another series of questions: Where do we go when we die? Are they all in the same place? Who’s really in charge? With questions like this burning in my mind – well, off and on, after all, it was the 70’s! – I began the age old journey of the truthseeker. During the next 10 years, I lived off and on in various monastic communities while continuing to work in the legal field. In 1976, my dad introduced me to tarot and astrology. The late 70’s and 80’s were spent experimenting with divination and astrology, coming to an understanding of archetypes, and trying to assess the karmic implications of various friends, as well as the law firm’s divorce clients and criminal defendants with whom I interacted daily. I worked with notable attorneys in Miami on high profile cases, and found the work very exciting and rewarding. I studied Eastern philosophy and even got involved with a cult or two. I gained invaluable experience, I was glad to be in and glad to be out. I took Transcendental Meditation, yoga, est, the Dale Carnegie course, primal scream therapy, Gestalt Therapy, Transactional Analysis, rebirthing, Neuro Linguistic Programming, Silva Mind Control, Biomagnetics, Therapeutic Touch and began teaching meditation and psychic development. In 1983, my Uncle Jimmy built me a house in a little patch of woods just north of Indian River County, and I settled into a comfortable job with the biggest law firm in town, and spent my spare time studying and writing. 22 years later, I’d left the legal field, and for several years worked the phone line for Psychic Friends Network. I also began teaching yoga and offering tarot card readings a few days a week at local new age stores, teaching popular weekly tarot classes, psychic development, and teaching about the human energy field. In 1991 I met Theresa Richardson and Kristy (fka Scott) Swaim Souto, who were also on the path and interested in meditation and metaphysics. Within a year, Horizons Magazine was born. The magazine barely paid for itself the first couple of years, and that took its toll on the partnership. Theresa and Kristy were each raising young sons and experiencing lots of changes in their lives, and I worked from home for the Psychic Friends Network, and had plenty of time to devote to the magazine. By 1996, I began doing the magazine on my own. In 1996, my mother and husband died, and I spent 8 months in John Steinbeck’s Salinas, CA. I began several writing projects and became acquainted with several popular authors in the personal growth field. I’d often dreamed of becoming an author. Meeting these people and getting to know them let me see that their life was more about book tours and book promotion than it was about writing and teaching. Although I understood the need for this, it helped me decide that was not the kind of life I wanted. It did however introduce me to the world of professional consulting and ghostwriting, and I entered into several collaborations and close friendships that remain to this day. 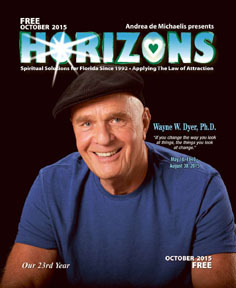 I currently publish Horizons Magazine , teach about the human energy field and interaction with nonphysical energy. I instruct in law of attraction, kundalini management, meditation, psychic development and mediumship, divination, reaching creative potential and peak performance, spiritual marketing and pre-press for publication. I became an ordained minister in the State of Florida in September 2000. I am an intutitive astrologer, with a focus on uncovering your soul’s mission in this lifetime, and your soul purpose in relationship with others via birthdate compatability charts. I am a graduate of The Monroe Institute Gateway Voyage program and have completed Pranic Healing levels I and II with Master Stephen Co. I have completed Reiki I and II, I am a certified professional hypnotist, paranormal consultant, voiceover talent, ghostwriter and editor. I live with my extended family in a small wooded sanctuary just north of Indian River County, FL. You can see I’m not a great writer. I’m just a regular gal who’s been blessed with the time and resources to do some interesting things and I like sharing my stories. I have learned that whatever I am going through is likely what everyone else is going through also. I’ve found out a lot of what works and what doesn’t and gotten some profound insights along the way. If I can save someone time and money, or heartache and frustration, by telling my story, that’s what I live for. 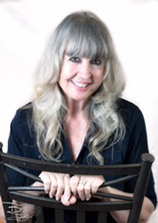 As a professional psychic since the 80’s, I’ve spoken with thousands of people through the years. This allows me to see patterns in behavior and to recognize when something is happening on a big scale. It’s like having a constant test group I can study, and I share my findings with you here in this blog. I would just like you to know you are capable of far more than you ever dreamed and there is an internal compass that guides you in every moment by the emotions you are feeling in response to the thoughts you are thinking. You have more choices available right now than you ever thought possible. And your goals are easier to reach than you ever imagined. And it’s never too late to start cleaning up your karma. This is such an outstanding account. I loved reading every word and somewhere between the lines I sensed a strong connection with you from our past lives. More I read more I discover myself in these amazing words. I am so glad that we met you and I believe one way or another it was meant happen. My story is not so different and my words are not so far from yours. We are here to make things better, to create to accept to celebrate and to love. Many blessings.